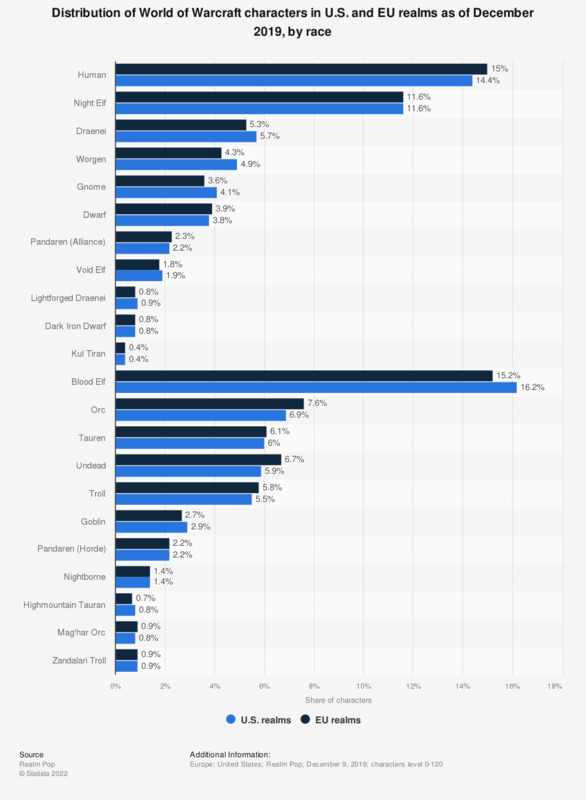 The statistic shows the share of the various races in the online computer game World of Warcraft as of February 1, 2019. Approximately 5.1 percent of all characters in U.S. realms were Worgen. In terms of class distribution, in the same time period the majority of WoW players have chosen hunter as their character. World of Warcraft is an immensely popular massively multiplayer online role-playing game, also known as MMORPG, developed and published by video game developer Blizzard Entertainment in 2004. In the third quarter of 2015, the game had a total of 5.5 million subscribers, however as of that time the developer chose not to disclose subscriber figures any more. Still, other metrics indicate the game does not lack in popularity, as its expansion packs sell millions of copies within 24 hours of their release. There are a total of 14 playable races in the game. World of Warcraft servers are divided into different ‘’realms’’ based on the continent of the player. The distribution of World of Warcraft characters in the U.S. and EU realms is very similar. As of June 2017, humans were the most popular race, having been chosen by a total of 16.5 percent of all U.S. realm players, while closely accounting for 17.2 percent of the entire EU realm population. The largest percentage difference between the U.S. and EU realms with regards to the choice of race was with the Blood Elves. Approximately 15.9 percent of all U.S. realm players chose the Blood Elf as their character, while only 14.2 percent made the same choice in EU realms. However, each of the other nine races only has a one percent or less difference between the choices, clearly illustrating the popularity of each race. World of Warcraft is a game primarily purchased and downloaded online through a subscription service. This trend coincides with the significant decrease of physical game purchases from 80 percent in 2009 to 26 percent in 2016, while digital game purchases surged from 20 percent to 74 percent in the same time period. As of 2017, the most popular genre of video games shooter, accounting for 25.9 percent of all video game sales that year. Role-playing games, such as WoW, ranked third, with 11.3 percent of the market based on sales. For this analysis, 24.67 million characters on US realms and 23.1 million characters on EU realms were recorded. The data were collected by using Blizzard's Battle.net API. Do you think ordinary people can make a difference in the fight against corruption in Brazil?